Wicked! the musical has just announced the opening of its 21st booking period on Monday 1 February 2016 at 10am, with over 500,000 new tickets going on sale for performances until Saturday 29 April 2017. The long-running London production is now in its 10th anniversary year and continues to break Box Office records at the Apollo Victoria Theatre, most recently setting a new house record with a weekly gross of £1,030,379.00 (for the week ending Saturday 2 January 2016). 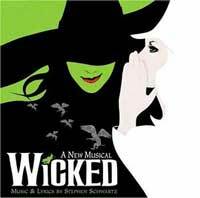 Wicked currently stars: Emma Hatton (Elphaba), Savannah Stevenson (Glinda), Oliver Savile (Fiyero), Liza Sadovy (Madame Morrible), Tom McGowan* (The Wizard), Sean Kearns (Doctor Dillamond), Daniel Hope (Boq), Katie Rowley Jones (Nessarose), Natalie Andreou (Standby for Elphaba) and Carina Gillespie (Standby for Glinda).